We recommend an appointment every 6 months for the maintenance of healthy gums and teeth. An examination will identify any oral health issues, and a scale and polish will remove plaque and tartar. Fluoride treatment may be applied to reduce your risk of decay. 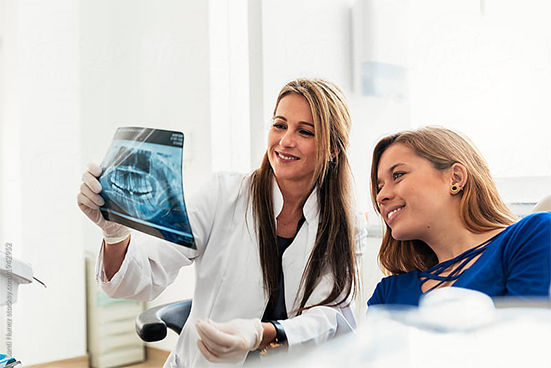 To determine whether X-rays are needed your dentist will review your history and examine your mouth, looking at your present oral health, your age, risk of disease and any signs and symptoms of oral disease. X-rays are suitable for children and adults. If you are pregnant or concerned about having an x-ray please speak to the dentist. Dental Fillings are used to repair damage to the structure of teeth which can be caused by tooth decay, wear or trauma. Commonly, we repair with tooth coloured fillings, either resin or porcelain. Simple extractions and some minor oral surgery cases for wisdom teeth can be treated in our clinic. An OPG (whole mouth x-ray) may be required for the assessment of wisdom teeth. Complex cases may be referred to a local oral surgeon. We offer local anaesthetic with the option of happy gas for anxious patients. Please discuss with your dentist if you require sedatives or general anaesthesia.